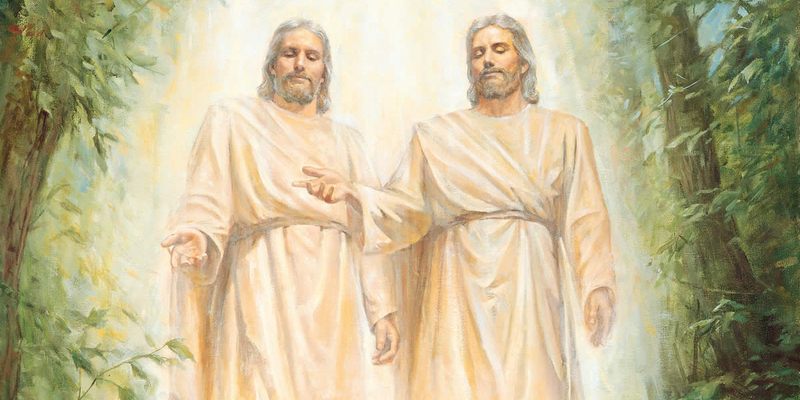 This somewhat perplexing teaching has received much attention by Latter-day Saint doctrinal and scriptural commenters.1 While views on this passage are somewhat varied, the point most interpreters derive is that this passage is about and fluidity of Christ’s titles and roles, not that He is “one God” with the Father as in a Trinity. It is also significant how this passage is illuminated when read in an ancient Mesoamerican context. Mark Alan Wright and Brant Gardner have commented on the so-called ancient Mesoamerican “deity complexes,” or the phenomenon in which “a single god could be represented with a variety of differing characteristics or manifestations. Their names, attributes, and domains of influence were fluid, yet they retained their individual identity. Each of the elaborations that a modern reader might see as a different deity was actually considered to be merely an elaboration of the complex essence of one particular deity.”5In other words, ancient Maya religion allowed for a single deity to take on a number of interchanging titles and attributes, but remain a single, unique deity. With this in mind, Wright and Gardner argued that “Abinadi’s explanation in Mosiah 15 of how Christ is both the Father and the Son could also be read as an example of multiple manifestations of a single deity,” and therefore can easily be understood as an ancient Nephite version of the Maya deity complex. What changes isn't Christ's inherent nature or relationship to God the Father (they don't suddenly become “one God” in a Trinitarian sense), but rather the roles, attributes, and titles Christ carries based on the context of how he's being depicted or described. “The Father and the Son,” Ensign, April 2002 . 1. See Rodney Turner, “Two Prophets: Abinadi and Alma (Mosiah 14–18),” in Studies in Scripture: Volume Seven, 1 Nephi to Alma 29, ed. Kent P. Jackson (Salt Lake City, UT: Deseret Book, 1987), 240–260; Joseph Fielding McConkie and Robert L. Millet, Doctrinal Commentary on the Book of Mormon: Volume II–––Jacob through Mosiah (Salt Lake City, UT: Bookcraft, 1988), 225–243; Robert L. Millet, “The Ministry of the Father and the Son,” in The Book of Mormon: The Keystone Scripture, ed. Paul R. Cheesman (Provo, UT: Religious Studies Center, Brigham Young University, 1988), 44–72; Monte S. Nyman, “Abinadi’s Commentary on Isaiah” in The Book of Mormon: Mosiah, Salvation Only Through Christ, eds. Monte S. Nyman and Charles D. Tate, Jr. (Provo: Religious Studies Center, Brigham Young University, 1991), 161–186; Jeffrey R. Holland, Christ and the New Covenant (Salt Lake City, UT: Deseret Book, 1997), 103–105; Paul Y. Hoskisson, “The Fatherhood of Christ and the Atonement,” Religious Educator 1, no. 1 (2000): 71–80; Brian K. Ray, “Adoption and Atonement: Becoming Sons and Daughters of Christ,” in Religious Educator 6, no. 3 (2005): 129–136; Jared T. Parker, “Abinadi on the Father and the Son: Interpretation and Application,” in Living the Book of Mormon: Abiding by Its Precepts, ed. Gaye Strathearn and Charles Swift (Provo, UT and Salt Lake City, UT: Religious Studies Center, Brigham Young University, and Deseret Book, 2007), 136–50; Brant Gardner, Second Witness: Analytical and Contextual Commentary on the Book of Mormon, six volumes (Salt Lake City, UT: Greg Kofford Books, 2007), 3:299–308; Ed J. Pinegar and Richard J. Allen, Commentaries and Insights on the Book of Mormon: 1 Nephi–Alma 29 (American Fork, UT: Covenant Communications, 2007), 392–400; Kathryn Jenkins Gordon, Scripture Study Made Simple: The Book of Mormon (American Fork, UT: Covenant Communications, 2015), 204–207. 2. “The Father and the Son,” Ensign, April 2000; Holland, Christ and the New Covenant, 179–193. 3. Benjamin likewise taught that those who make covenants with God “shall be called the children of Christ, his sons, and his daughters” (Mosiah 5:7). 4. See Book of Mormon Central, “Did Pre-Christian Prophets Know About Christ? (1 Nephi 10:17),” KnoWhy 12 (January 15, 2016). 5. Mark Alan Wright and Brant A. Gardner, “The Cultural Context of Nephite Apostasy,” Interpreter: A Journal of Mormon Scripture 1 (2012): 35–36. 6. Wright and Gardner, “The Cultural Context of Nephite Apostasy,” 37. 7. Susan Easton Black, “Jesus Christ, names of,” in Book of Mormon Reference Companion, ed. Dennis L. Largey (Salt Lake City, UT: Deseret Book, 2003), 457–458. 9. See John W. Welch, “The Testimonies of Jesus Christ from the Book of Mormon,” in A Book of Mormon Treasury: Gospel Insights from General Authorities and Religious Educators (Provo: Religious Studies Center and Deseret Book, 2003), 316–342, and Charting the Book of Mormon (Provo: FARMS, 1999), charts 44–47. 10. Paul Y. Hoskisson, “The Fatherhood of Christ and the Atonement,” Religious Educator 1, no. 1 (2000): 76–77.